(CNN) -- Our everyday concerns -- what's for dinner, what to update on Facebook -- seem small when we consider that there's a whole universe out there where other life may exist. Astronomers now are upping that likelihood, announcing that they've identified a star system with up to seven planets -- three of which could potentially host life -- 22 light-years away. The likelihood that conditions could support life on at least one of those planets, given that there are three terrestrial-mass planets in the habitable zone of one system, is "tremendous," according to at least one scientist. 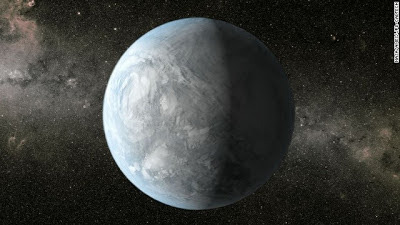 The "habitable zone" is the area near a star in which a planet can theoretically hold liquid water. In our own solar system, Venus is close to the inner edge of potential habitability, while Mars is closer to the outer edge. The discovery is the largest number of "habitable zone" planets ever found within a single system, said Guillem Anglada-Escude of the University of Gottingen, Germany, who led the team of astronomers. "As soon as our telescopes and data analysis tools have become sophisticated enough to find them, habitable planets are popping up everywhere," said Sara Seager, professor of planetary science at Massachusetts Institute of Technology, who was not involved in the study. "It's simply exhilarating to know that potentially habitable planets are ubiquitous." The three planets orbit a star called Gliese 667C, part of the triple-star system Gliese 667. They are between four and eight times the mass of the Earth, making them "super-Earths." If you were standing on any of the potentially habitable planets in this system, that sun would appear as a bright red star. The other two stars in the system "would look like a very bright pair of stars providing as much illumination as the full moon on Earth," Anglada-Escude said. The planets are likely either rocky or water worlds, meaning they're entirely covered in water. These particular planets also appear to be "tidally locked," meaning the same side of a planet is always facing a star. That means one side of the planet always gets light and the other hemisphere is always in darkness. "With three terrestrial-mass planets in the habitable zone, the likelihood of one of them actually being habitable is tremendous," Seager said. Scientists determined these characteristics of the star system using new observations gathered from the W. M. Keck Observatory and the Magellan Telescope, with existing data from the European Southern Observatory's HARPS instrument in Chile. If they orbited our sun, the Gliese 667C planets' surfaces evaporate and burn. But they may be habitable because their sun is so much smaller and dimmer. "It's an extreme scaled down version of the solar system," Anglada-Escude said. "Whether the planets are actually habitable would be pure speculation," Seager said. "There's currently no way to observe surface liquid water (our habitability requirement) or even infer the presence of surface liquid water."